choreography and open that up to readers. the needs of artists with disabilities and knew we needed to produce volume #7.2. Additionally, my aim was to have at least a glimpse into how their identities and histories situate and support personal questions, focuses and making of works. 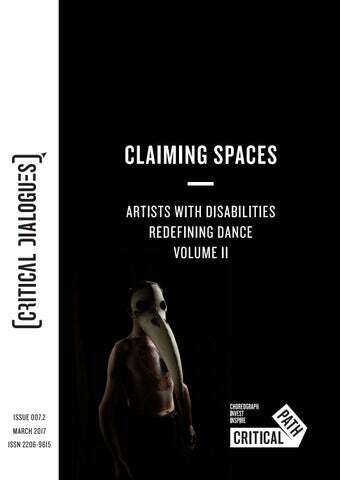 Each writer in the second edition of this volume (CD#7) demonstrates how artists create work out of the material they live, and how they foster new and unique choreographic approaches. Their actions as artists cut through and around different spaces â&#x20AC;&#x201C; social, political, artistic. The work foregrounds tensions, and questions the positions and actions, of artists with disabilities in â&#x20AC;&#x2DC;mainstreamâ&#x20AC;&#x2122; dance and society. By developing and inhabiting fringe areas and new centres (venues, content, technique) they develop spaces to work and thrive. These artists embody changing perspectives and perceptions of what dance is, who is a dancer, which techniques are acceptable and who can answer these questions. Each of them claims, reclaims, forms and opens spaces to create change. Dr Laura Osweiler BIO Dr Laura (Amara) Osweiler is the General Manager at Critical Path. She has a PhD in Dance History and Theory from the University of California, Riverside. For almost twenty years, Laura has been an independent producer in the United States and now Sydney. Her work include concerts, workshops, and conventions such as the Austin Belly Dance Convention, An Evening of Experimental Middle Eastern Dance (EEMED), Xâ&#x20AC;&#x201C;MED â&#x20AC;&#x201C; workshops on experimental dance, and Improvisational Dance Series. She is also a practicing artist, performing as a soloist and in dance companies and teaching dance and pedagogy at several university and festivals. from dancing makes the pain worthwhile. reaching for the next purchase. the ever-changing landscape of my body. strengthening qualities dance has to offer. integrate mobility aid devices on stage. dance artists, William Forsythe, Julyen Hamilton, David Zambrano, Gill Clarke, Rosemary Butcher and Rosalind Crisp. introduce a new vocabulary of movement. and performative aspects on the material. an internal connection in one’s own body. natural selection or ‘survival of the fittest. both for and against eugenics. validity and right to exist. of evolution, genetics, mutation and eugenics are mutual interests. we had envisioned into a 30-minute work. breeding for hundreds of years? this work can cover such immense topics (each worthy of their own full length piece) without â&#x20AC;&#x2DC;glossing overâ&#x20AC;&#x2122; or blanketing the issues, it will feature quotes from historical and contemporary figures, to allow the audience to develop opinions and discussions independent of the material and/or the artistsâ&#x20AC;&#x2122; view. Socio-economic status, location and population, through living conditions and reproduction of demographics, can be either the product or the instigation of eugenic outcomes (sometimes both at the same time). The intention of this triptych is to challenge the dissociation of the majority of people as to how eugenic philosophies affect their lives and the lives of people around them. In reality, eugenics is being openly practiced through a range of social, political and economic spectrums that affect the human race as a whole. The next few months are an exciting time for me. As I explore new conceptual interests, choreographic processes and personal boundaries and potentials (both physically and personally) in-depth. I feel in many and immeasurable ways that I am only just starting my journey in dance. in a world without sight or sound by using art, theatre and sensory performance. all of her life and worked as a piano tuner. Heather Lawson is an emerging artist. had a keen interest in the arts. bridge that we can to our audiences. combination of skills required for the job. where they need to take their own steps. another through touch by feeling one another’s face and exploring their own way of communicating. We have four tactile interpreters, additional tactile guides, a social haptic consultant, technical manager, two support workers. Touch is an incredibly profound sense. someone puts out their hand. every audience member to experience. leads me away from the comfort of my seat. immediate and complete trust in that hand. footsteps are much slower and smaller. not sure what was happening around us. who remain unseen in this entire sequence. and then pass that audience member to next tactile guide for a different sequence. It’s like a rite of passage. hands to connect with others. part of the Sydney Festival program in 2017. My About Town. <http://www.myronmy. me/2016/09/imagined-touch-review.html?m=1>. Touch.’ Aussie Theatre. <http://aussietheatre.com. au/reviews/arts-house-imagined-touch>. Myron, M. 9 Sep 2016. New Normal National Arts and Disability Strategy, August 2016.
with artists with and without disabilities. need to identify with having a disability. and I an eclectic pallet to draw from. listen and respond to individual stories. them from a different point of view. performers became confident in sharing. the way we understand something we see. themselves to the world around them. element and the performers’ dialogue when Auslan wasn’t being signed. it properly. So change tact and try again. supported the process of this work. from a tick. In Australia. different ways of being, living and creating. what?!?! Whay? !” Seems crazy, right?! include artists with disability regardless of the topic. who appear to have signs of depression. there were signs that were simply ignored. afraid that the children might be harmed. and return to my home town in Pingtung. quite so wrong in our society. was gone, my life became disordered. many tragic suicides and murders. relationship of the work’s content. my dream of being a professional dancer. where I started to choreograph. centre to explain my research and work. certain people in my choreography. How did the dancers get into character? material which I used to create the dance. character struggles with her actions and emotions. Sometimes she acts normal. character is calming down her anxiety. concerts scheduled this year in Taiwan. this increasing and important social issue. Our future projects with the government and education specialists will lead to matters improving. move to a personal song that is within us. I have made two more DANCE DIARIES films with different communities. in partnership with Woodville Alliance. and by this particular ensemble of people. move in their own extraordinary ways. question yet to be answered. culturated thinking patterns and beliefs. moved and also the mood in the room. right to be exactly who they are. time – the images emerge. The artwork (i.e. the film) is the making of what happens. dancer, perform a short piece for them. Four of six families agreed to be filmed. (i.e. as opposed to being a ‘participant’). a license to their own poetic expression. camera and then folded over out of view. we are all planning to work together in 2017.
artist and this takes time. Australian Academy of Performing Arts). dance, and indeed, disability was limited. opportunities for dancers with disabilities. into our traditional dance institutions. been denied the right to do so? the long term. My creativity is limited to the aesthetic of able bodiness and both the negative and positive aspects of this notion. to explore it in its entirety. in the middle of this hierarchal structure. having already learnt their craft flourish. free ourselves from these conventions. of inclusion in all facets of dance education. reason I will begin with it. the aesthetic of disability, able bodieness. to the art of gymnastics. on stage! Who cares if you can’t hear the music! Who cares if you dribble or drool! Who cares if you shake uncontrollably! own conservative values at the front door. own culture and not the dominant hierarchy. versions of what is considered acceptable. perception that we want to be like others. a way in which to find it. aesthetic and not the able bodied version. It is time to shake things up. ‘good’ side of ourselves and not the ‘bad’. conventions behind? The answer is up to us. Path’s Residency Program Body as Material. 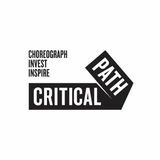 choreographer based in Western Australia. movement through his own physicality. of various Australia Council grants for professional development As a mentee of Dan Daw, a UK based dance artist with a disability, Joshua engaged on an international level with integrated dance companies in both Europe and the UK. At present, he divides his time between various independent projects on the East Coast of Australia and as a dancer for Touch Compass, New Zealandâ&#x20AC;&#x2122;s first integrated dance company, where he dances for them on a project basis. Artists speak about their experiences and claiming spaces as artists with disability.